OAKLAND, CA, USA—JULY 23, 2018—On August 1, humanity will have used nature’s resource budget for the entire year, according to Global Footprint Network, an international research organization. This date is called Earth Overshoot Day—the date when humanity’s annual demand on nature exceeds what Earth’s ecosystems can renew in that year. In other words, humanity is currently using nature 1.7 times faster than our planet’s ecosystems can regenerate. This is akin to using 1.7 Earths. The costs of this ecological overspending include deforestation; collapsing fisheries; fresh-water scarcity; soil erosion; biodiversity loss; and the buildup of carbon dioxide in the atmosphere, leading to climate change and more severe droughts, wildfires, and hurricanes. These threats can produce desperation and force many people to migrate to cities or other countries. In New York, a short video in Times Square from July 20 to August 3 features stunning footage by award-winning cinematographer Louie Schwartzberg. From Oakland and Paris, Global Footprint Network and Schneider Electric will host a webinar titled “Living on a Finite Planet: Strategies for Sustainable Resource Utilization” at 8 a.m. PDT / 3 p.m. UTC Tuesday, July 24. To register, visit bit.ly/2KQrY1B. In Berlin, Germanwatch and Inkota and other partners will hold an Overshoot Day press conference at 9 a.m. CET August 1. In Rio de Janeiro, Brazil, the Museu do Amanhã (Museum of Tomorrow) will show a special screening of “Under the Ox Paw,” a documentary film about the cattle invasion in the Amazon, on August 1. In the 10 U.S. cities with the largest carbon footprints, more than 10,000 free Endangered Species Condoms will be given away by the Center for Biological Diversity. Global Footprint Network will feature these events and more with interviews from around the world through a live broadcast on Facebook and YouTube at 11 p.m. July 31 PDT / 6 a.m. Aug. 1 UTC and 9 a.m. August 1 PDT / 4 p.m. UTC. To watch, visit www.facebook.com/GlobalFootprintNetwork. The show will include interviews with Christiana Figueres, the former climate chief of the UN; Erik Solheim, executive director of the UN Environment Programme; Nicolas Hulot, the French minister of ecological transition; Terry A’Hearn, Chief Executive Officer of the Scottish Environment Protection Agency; David Levine, CEO, American Sustainable Business Council; Carter Roberts, CEO, World Wildlife Fund US; Kathleen Rogers, President, Earth Day Network; Esther Finidori, Manager of Environmental Performance and CO2 Strategy, Schneider Electric; and cinematographer Louie Schwartzberg. The show also will feature partners from WWF China, France, Japan, and Russia; ZERO, an environmental partner in Portugal; and from the U.S., Center for Biological Diversity, Cloud Institute for Sustainability Education, Powerhouse, and Turning Green. Cities: If we reduce driving by 50% around the world and replace one-third of car miles with public transportation and the rest by walking and biking, we can #MoveTheDate of Overshoot Day back 12 days. Energy: Reducing the carbon component of humanity’s Ecological Footprint by 50% would #MoveTheDate 93 days. 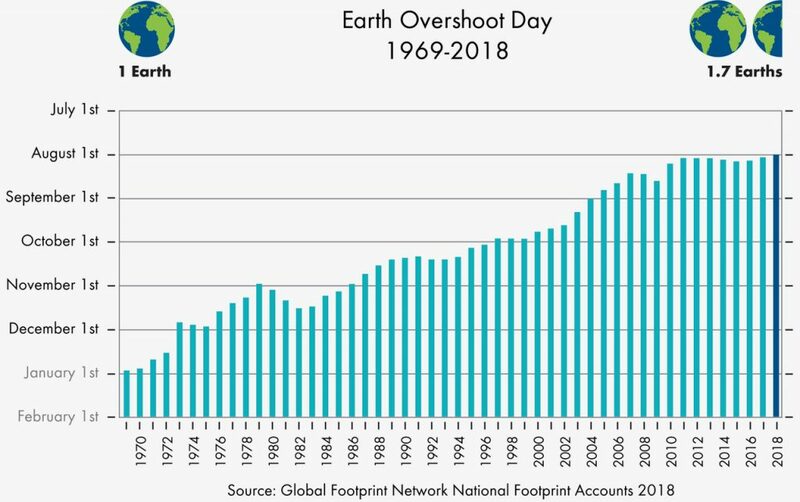 Although 86 percent of the world’s population lives in a country with an ecological deficit, the latest national Ecological Footprint data reveals some encouraging signs for moving back Earth Overshoot Day. The Ecological Footprint of China, the country with the largest total Ecological Footprint, decreased 0.3 percent from 2013 to 2014 after a steady climb since 2000, when it was half as large as it is today. 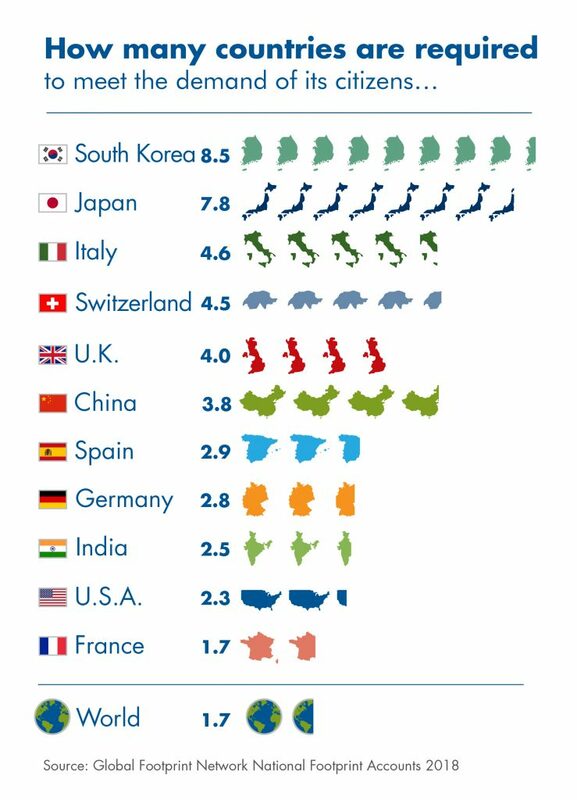 China’s Ecological Footprint per person also decreased by 0.8 percent from 2013 to 2014. The decline stems in part from a decrease in China’s total carbon Footprint by 0.7 percent and its per-person carbon Footprint by 1.2% from 2013 to 2014. 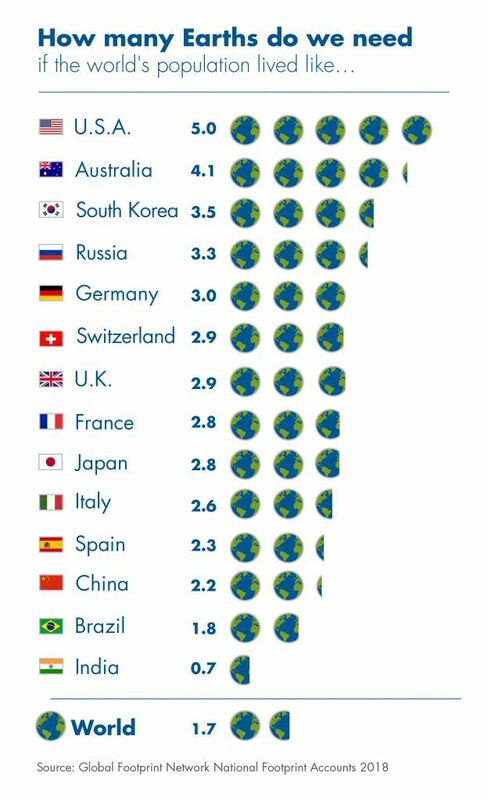 The Ecological Footprint per person for high-income countries has declined 12.9 percent since 2000. Some of the countries with the largest declines since 2000 include Singapore (-32.1 percent), the Bahamas (-26.2 percent), Denmark (-19.0 percent); United States (-18.4 percent), United Kingdom (-16.6 percent), and France (-15.5 percent). Germany experienced an 8 percent decline in its Ecological Footprint per person since 2000 and a 2.5 percent decline in its Ecological Footprint per person from 2013 to 2014. The carbon component of Germany’s Ecological Footprint declined 6.2 percent from 2013 to 2014.